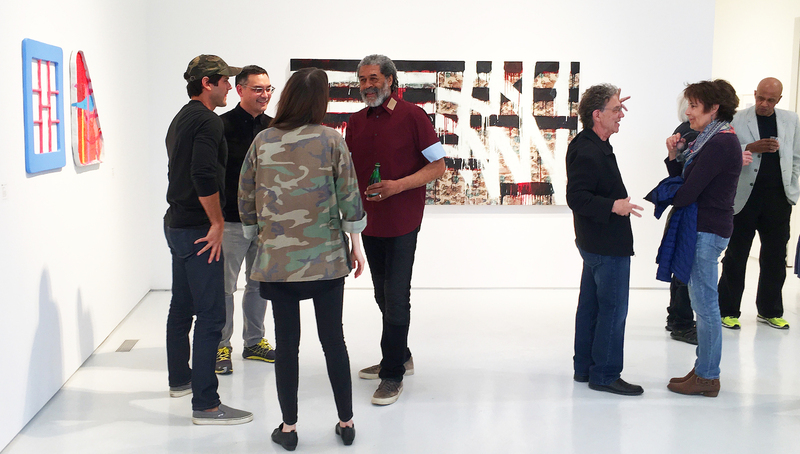 Hill Gallery in Birmingham, Michigan, opened a group exhibition curated by McArthur Binion on May 4, 2018, representing five Detroit-based artists. 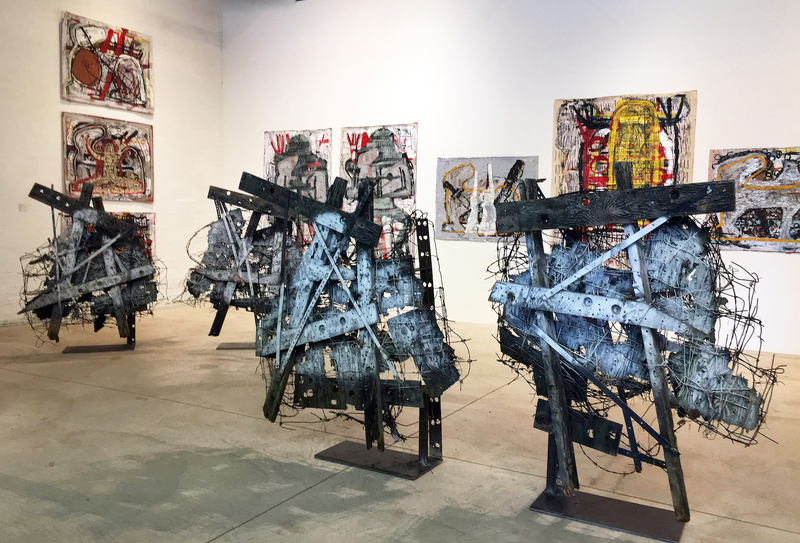 Although Binion and I were at Wayne State University in the early 70s, I was not very familiar with his work until I saw his exhibition last July representing the United States at the 2017 Venice Biennale. It was a powerful exhibition, and like many successful artists that fit the modernist profile, Binion makes work that is a study in oppositions: line and shape, figure and ground, image and abstraction, copy and original, color and black & white. His modus operandi is to somehow magically blend an assault of binaries into a single, unified emblem of the unique and complicated self. Although the laconic grids resonate with this viewer, I walked out of the exhibit thinking about the influence of the cross-hatch marks by Jasper Johns. 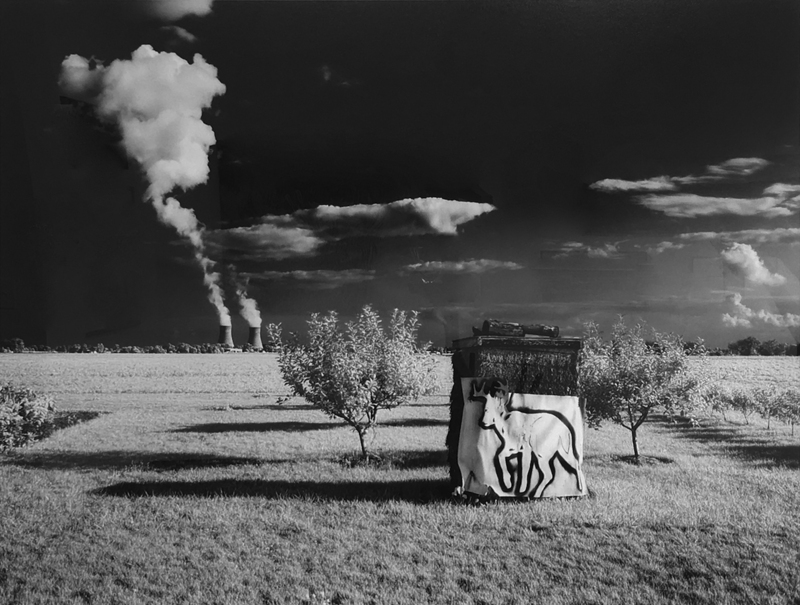 After earning his BFA from Wayne State University, Binion went on to complete his MFA at Cranbrook Academy of Art and became a professor of art at Columbia College since 1992. He describes his minimalistic abstract paintings as “Rural Modernist.” Is he referring to being born on a cotton farm in Macon, Mississippi where he was exposed to the West African textile designs in his mother’s quilts? Possibly. The first thing that jumps out from the work of Carole Harris is her choice of medium. 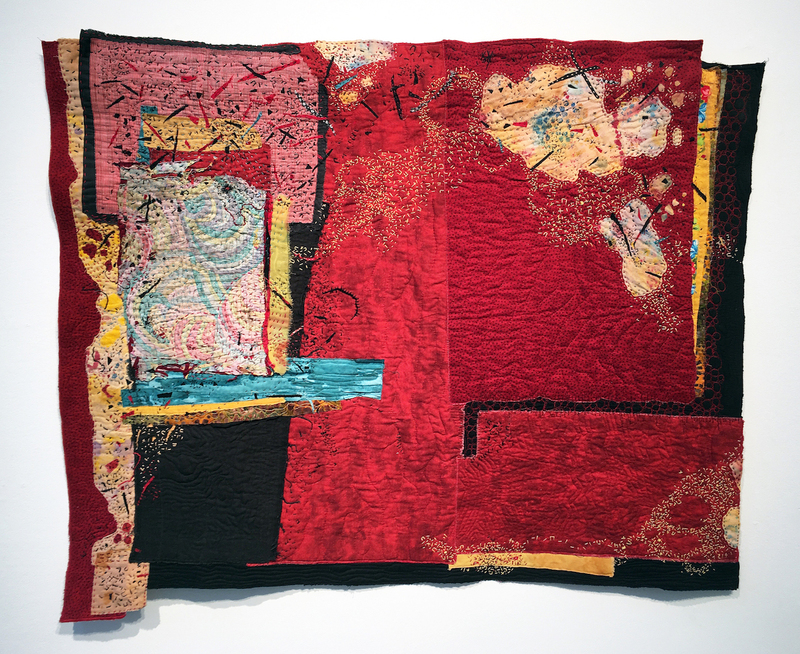 When I wrote about her work in April, 2016, I described it like this: “For visual artists who quilt, Harris’s work transcends the traditional expectations we think of when mentioning quilting. In a web-based reproduction, we see an abstract painting, dynamic in the use of color, line, shape and form. It’s only on closer observation that one realizes these are compositions executed using embroidery, stitchery and multiple patterns of cotton, silks and hand-dyed fabric.” In this viewer’s experience, especially in the Detroit area, this artist leads the way in creating abstraction using a large variety of cloth materials and stitchery. 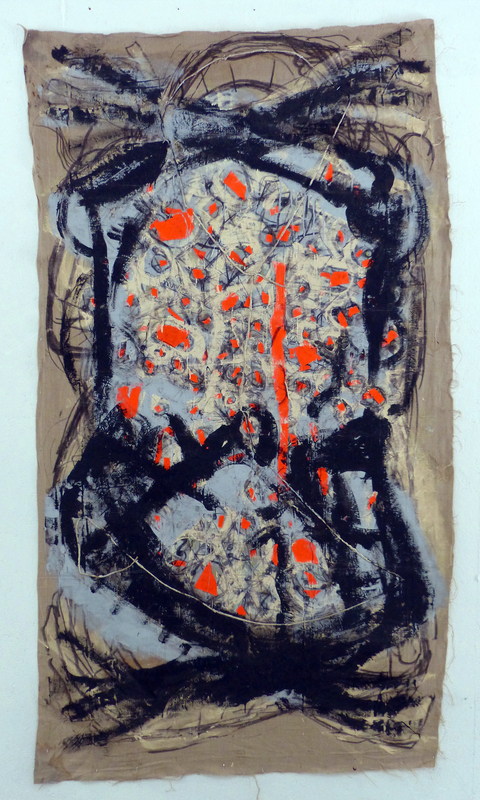 Langford’s large, abstract expressionistic painting, Mint / Red / Osois is acrylic paint over domestic textile on board. The stroke work reminds this viewer of a cross between Sean Scully and Franz Kline with textiles as a backdrop. 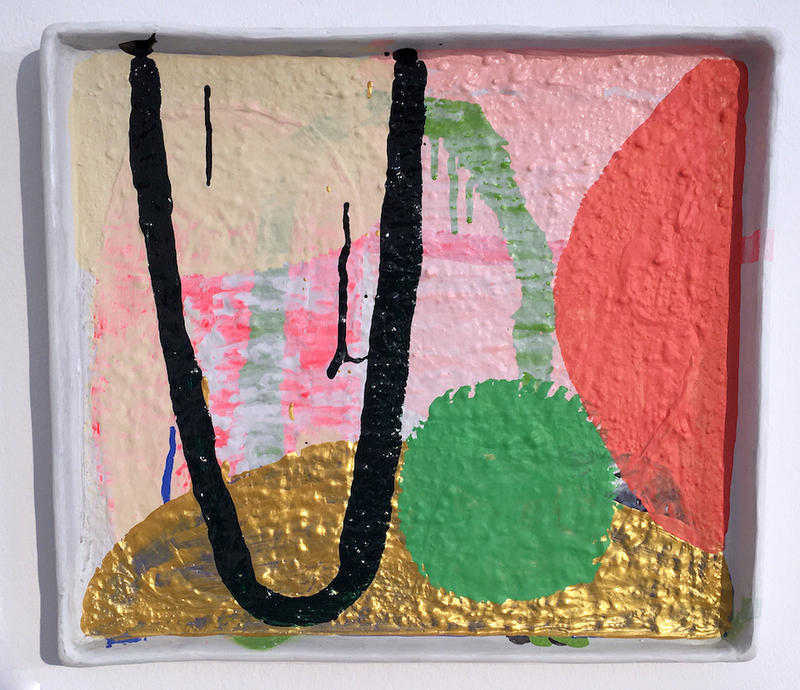 The diptych is powerful in its structure, execution and attraction to the vertical flow of dripping paint. 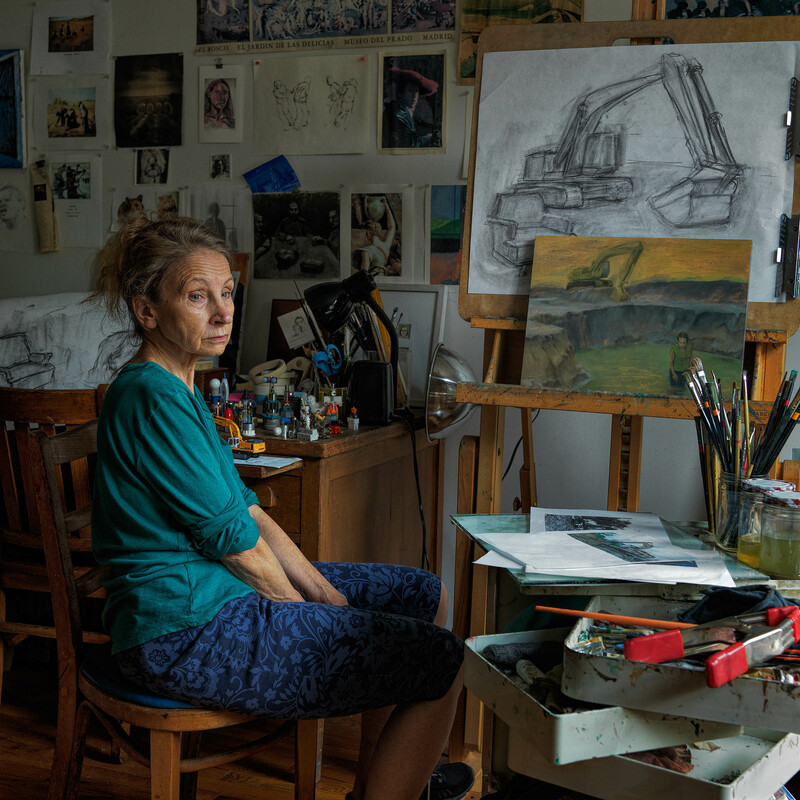 Langford earned her BFA in architecture at the Rhode Island School of Design and her MFA from Cranbrook Academy of Art. I became familiar with Langford’s work when she exhibited a solo show at the Simon DeSousa gallery with these semi-transparent white bars and controlled vertical drips of paint. One wonders what four years of architecture study does to an artist who wants to make things with her hands in a rigorous process of trial and error. 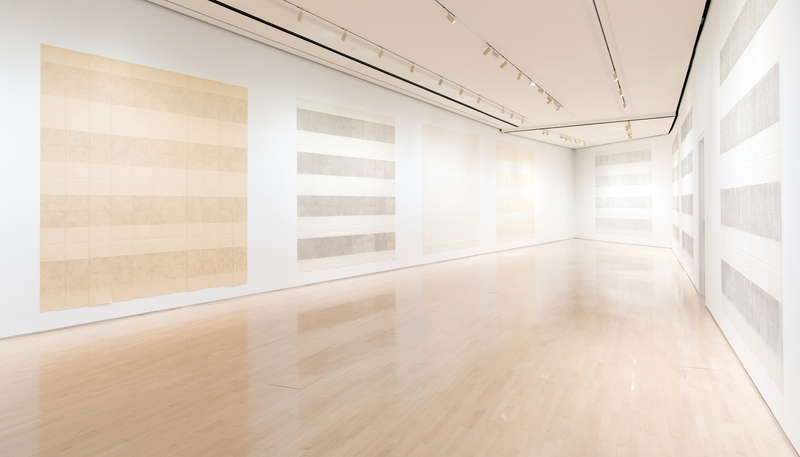 On her web site she mentions McArthur Binion as an influence, and this writer notices some of her earlier work came from N’Namdi Contemporary Gallery in Miami. 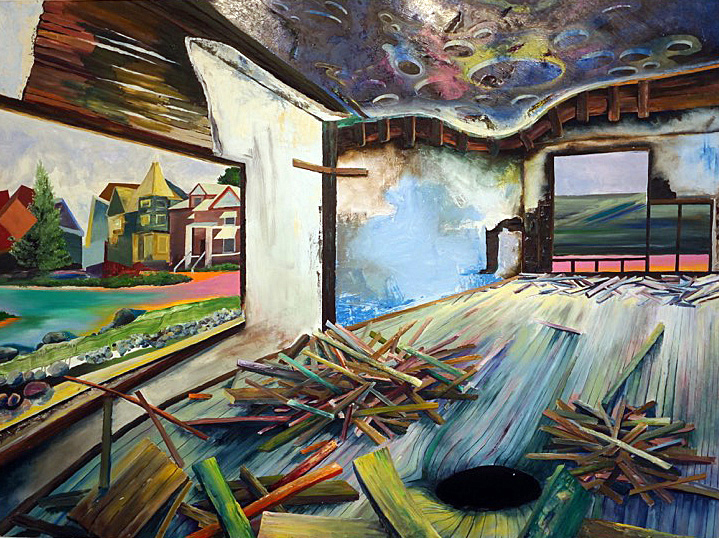 Part of the Binion show is another artist earning his MFA from Cranbrook Academy of Art, James Benjamin Franklin. 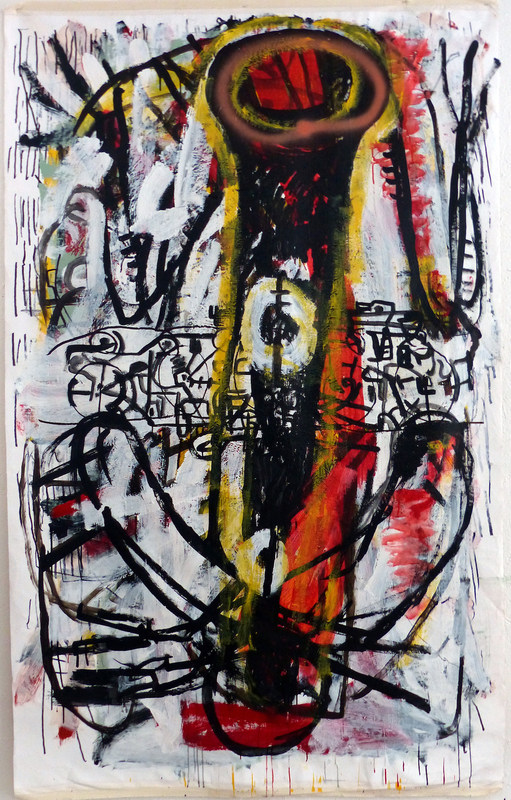 Currently living and working in Detroit, Franklin was recently in a group show at the Galerie Camille in midtown Detroit, and a solo show at Reyes Projects in downtown Birmingham. 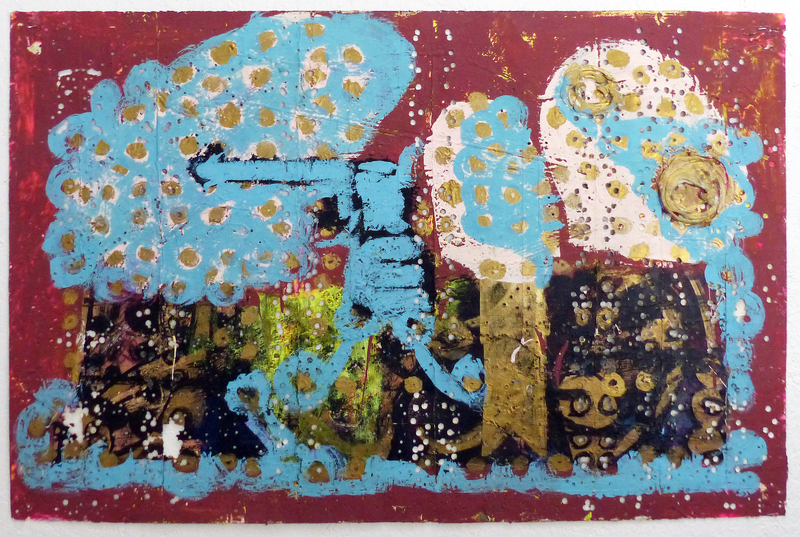 His small work, Untitled is acrylic, epoxy and aluminum, sealed in a rigid wrap on foam and typical of his recent work. 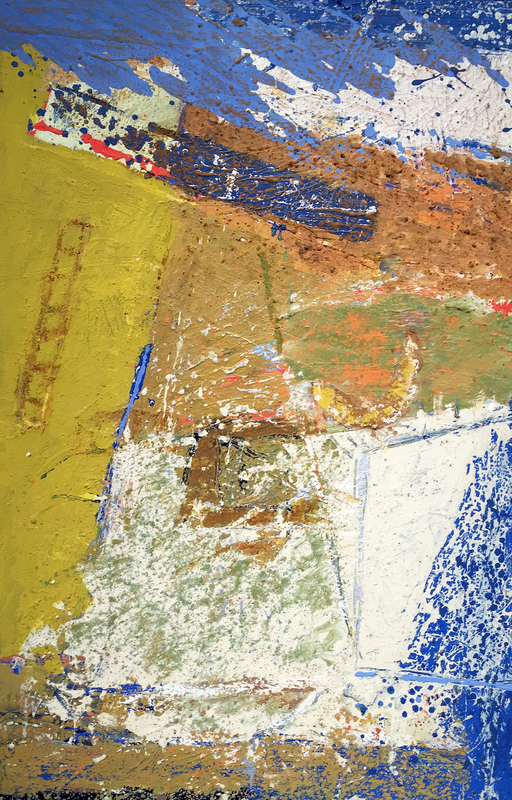 These works feel like naïve abstraction relying heavily on primary color and simple shapes. Occasionally he inserts a grid or web into his form. This younger artist’s work feels early in its development. 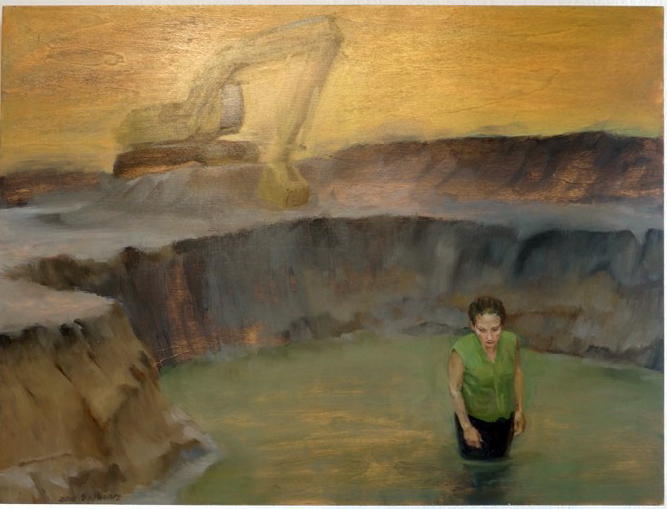 Again, Binion turns to his alma mater Cranbrook Academy of Art with work by Tiff Massey, who earned her Bachelor of Science from Eastern Michigan University, and a Master of Fine Arts in Metalsmithing at Cranbrook Academy of Arts. 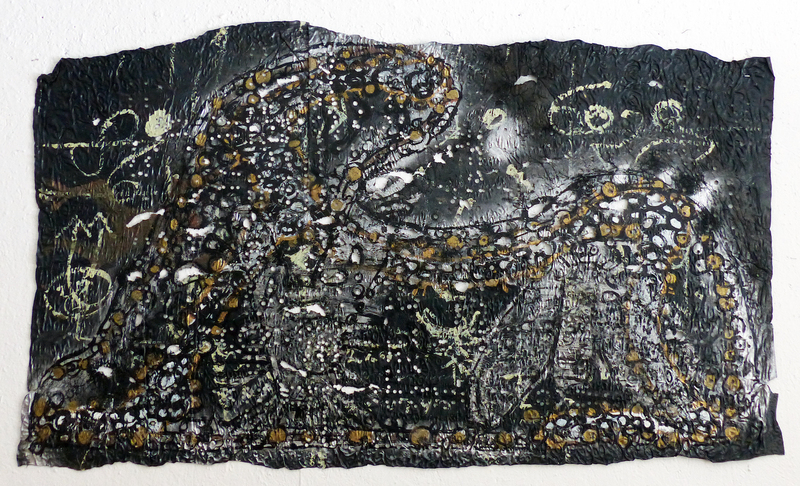 This early educational path in the sciences differs from other artists but seems to have migrated to metals and on from that point to various art forms. 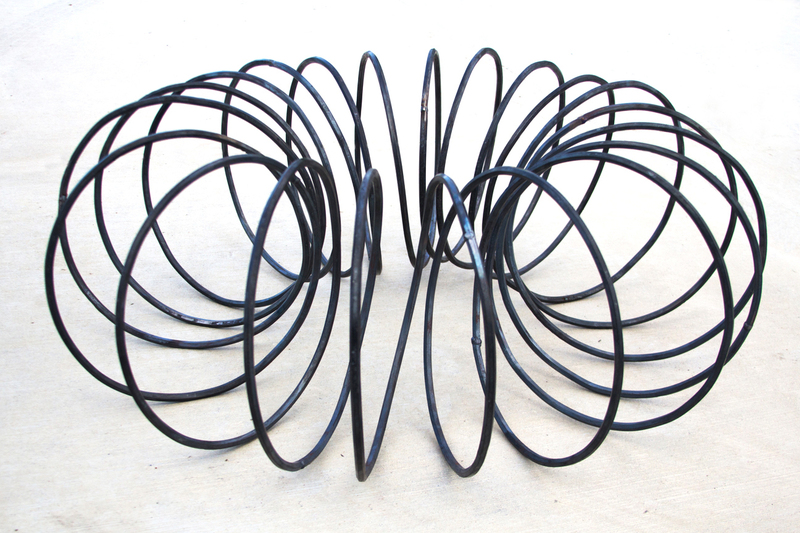 The floor sculpture, Spring Prototype 1 is coiled steel rod, maybe half inch in diameter and reminds this viewer of playing with a slinky as a child. Most importantly this work moves beyond plain and simple as its graceful and cultivated design leaves the viewer wanting to see more. The Hill Gallery opened its doors in Birmingham, Michigan in 1980 and has offered contemporary art representing sixty artists, both nationally and internationally recognized, along with an exceptional American Folk Art collection. In 1966, Andy Warhol was churning out silkscreens of electric chairs and car accidents, the Fluxus movement had given the world zany performances by the likes of Joseph Beuys and Yoko Ono, and Lichtenstein’s punchy Whams! and Bams!sprawled across gallery walls by the yard. 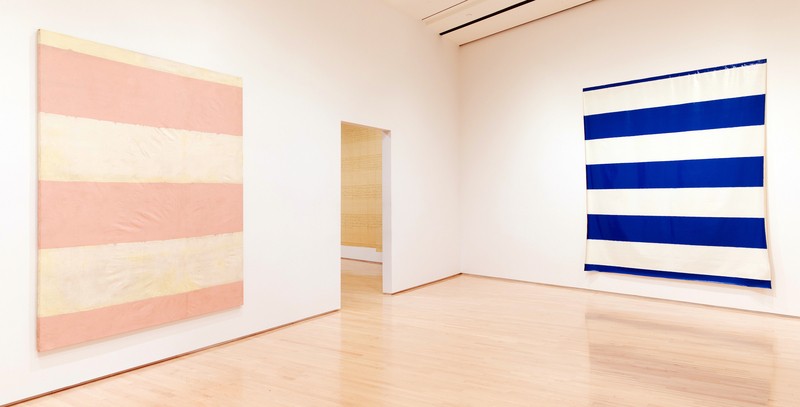 Against this cacophonic backdrop, when Michel Parmentier debuted his understated, monochromatic canvasses of painted blue stripes, they might hardly seem particularly radical, yet “radical” is precisely how Parmentier’s work is often described. Through October, Michigan State University’s Broad Art Museum allocates its whole second floor to exploring just what might be so groundbreaking about Parmentier’s work. The exhibition brings together 30 representative works spanning the artist’s career, along with rare texts authored by the artist. These allusive minimalist canvasses reveal the consistency of the artist’s philosophy, which remained largely unchanged from his early experiments in the 60s to the works he created just prior to his passing in 2000. Parmentier didn’t want his painting to be about anything other than the physicality of paint itself, so he abandoned subject matter. His work was guided by an almost religious adherence to the pliagemethod, for which he prepared a large un-stretched canvass by folding it like an accordion in increments of 38 centimeters. He’d then spray-paint the exposed surface, unfolding it to reveal visceral horizontal creases and painted bars in monochromatic, horizontal blue stripes. The creative act was thus reduced to a nearly-mechanical process. At first, his works might seem to rhyme with the striped paintings of Anges Martin. But Martin’s chromatically subtle works are warm, nuanced, and serene, while Parmentier’s have the impersonal detachment of an improvised painted banner advertisement. He worked in only one color each year. Wishing to disassociate his bars of color from any implied symbolism or personal significance, he’d change the color annually, switching from blue to gray in 1967, and finally to red in 1968. Parmentier joined forces with several other French painters (Buren, Mosset, and Toroni, collectively calling themselves BMPT), but broke from the group in 1967, perhaps believing the other artists were becoming too reactionary. [i] In 1968, he stopped painting altogether, not producing any art again for fifteen years. 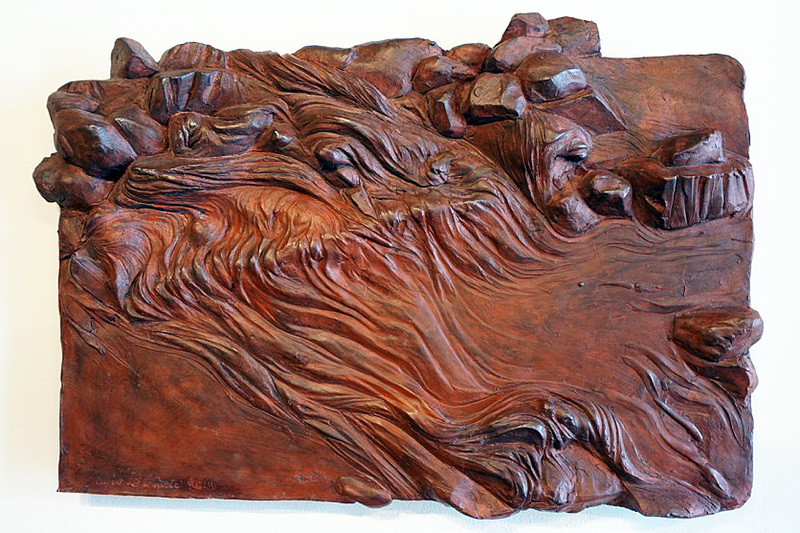 When he resumed in 1983, he integrated some variety in texture and media. Color disappeared altogether, replaced with varying values of graphite-gray or barely-discernible, creamy white. And in place of canvass, Parmentier began stapling together individual sheets of disconcertingly cheap printing paper. In addition to paint, he explored pastel, charcoal, and pencil. We even see trace elements of the artist’s hand start to emerge: rather than apply paint with a spray can, Parmentier took to scrubbing in his horizontal stripes with pastel, or applying thousands of neatly-arranged horizontal graphite marks. But his later works never strayed far from that which he produced the 60s. They invariably retained the same folded horizontal creases at 38cm increments, and they defiantly refused to be anything other than self-referential. The Broad Art Museum’s retrospective compartmentalizes the artist’s work chronologically, beginning with his earliest blue, gray, and red paintings from the 60s. As the artist intended, they’re unframed and affixed to the wall only at the top, making his paintings almost look like linens hanging up to dry. 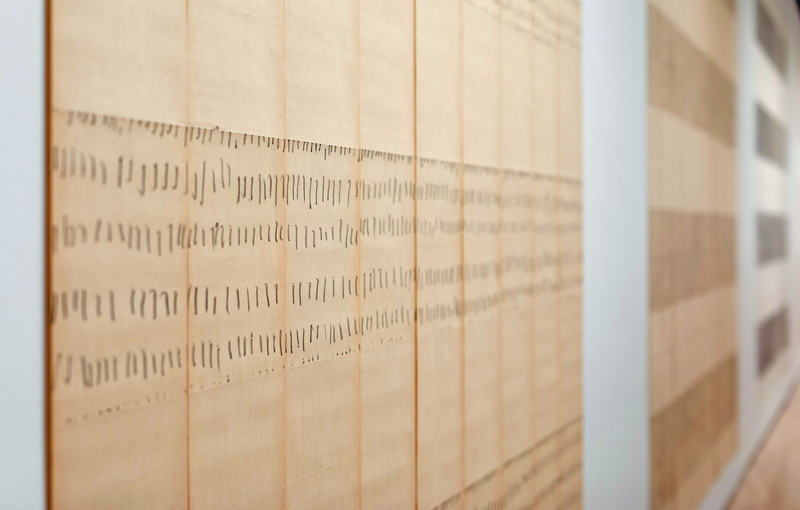 An adjacent gallery displays a large selection of the artist’s writings and projects a one-channel video showing the artist preparing a canvass using his signature pliagemethod, giving us a sense of the mechanical rigidity of his working process. A third gallery space is devoted to his later works, generally consisting of many sheets of paper affixed together, marked with graphite or pastel. 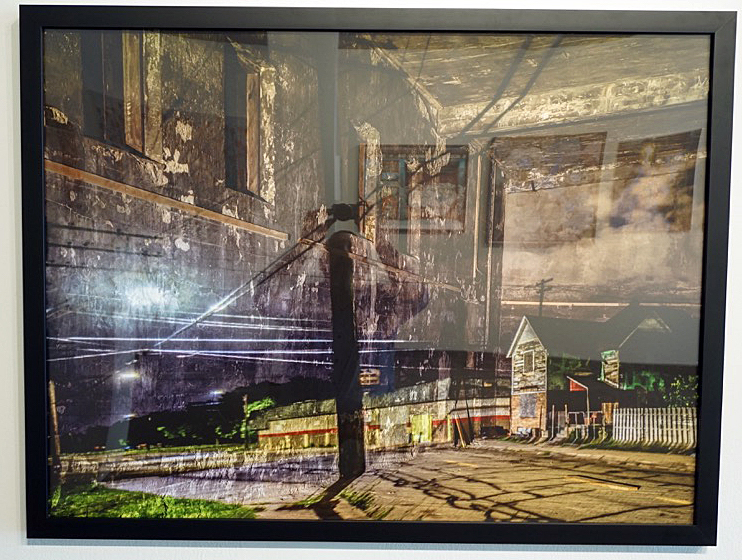 Here, viewers can see elements that get lost in translation when his work is reproduced in photos. Easily missable (even in person) are the dates he’d stamp repeatedly on the hem of each work; if a piece took him several days, we’ll see several dates, each stamped on the relevant section of the image. It’s an element that recalls the conceptual paintings of On Karowa, who famously produced paintings of the day’s date, always painted in white against a black background.